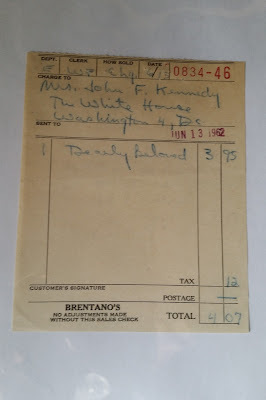 Recently I purchased a sales receipt for Jackie Kennedy from Brentano’s. Presumably, it came from the estate of aide Mary B. Gallagher. The book, Dearly Beloved, was the only novel written by Anne Morrow Lindbergh. 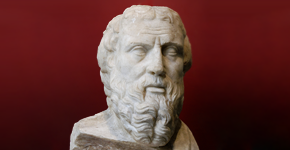 She was an accomplished writer best known for Gift from the Sea and also was an aviator. Dearly Beloved focuses on a wedding, the married couple and other members of the family. 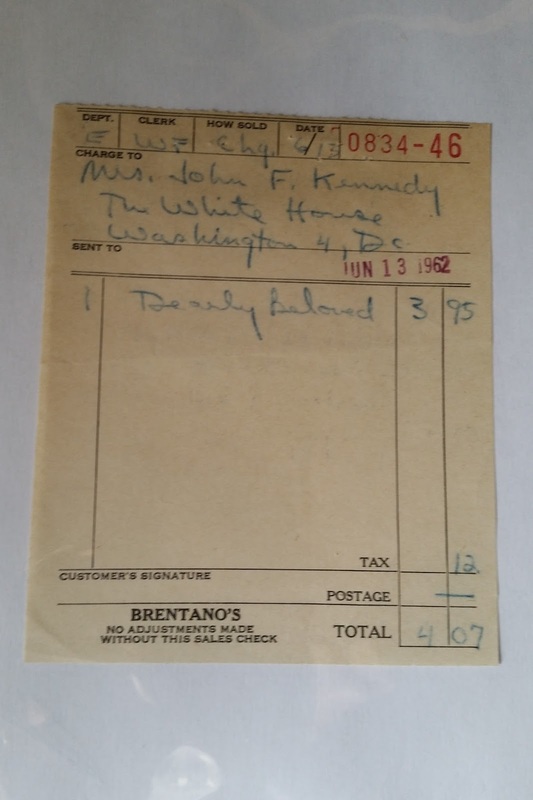 It was published on June 6, 1962, and Jackie purchased her copy one week later. The May 1, 1962 issue of McCall’s magazine had Jackie Kennedy and her children on the cover and the lead story was an excerpt of Dearly Beloved, which was also identified on the cover. Jackie and John Kennedy met Anne and Charles Lindbergh on May 11 at the White House dinner for French cultural leader Andre Malraux. Charles Lindbergh, then sixty years old, sat at the President’s table in the State Dining Room—he was always at table seven—and Anne sat next to Vice President Johnson in the Blue Room. The President also met with them before the dinner in the Oval Office. In addition to his hero status as an aviator, Lindbergh’s life was full of many ups and some considerable downs, including his commitment to American isolationism and his flirtation with Nazi Germany in the 1930s. It is noteworthy that arguably the two greatest aviation heroes of the twentieth century were invited to dinner at the Kennedy White House: John Glenn in April 1962 (Nobel Prize dinner) and Lindbergh in May 1962. Anne Morrow Lindbergh lived to be ninety-four and died in 2001.